The Fresh Air Solar Powered Skylight by VELUX features a solar panel that captures any available daylight and uses it to recharge a highly efficient, fully concealed, battery powered operator and control system. The battery powered operator is the power source that opens and closes the skylight and the solar panel serves as the charging source of the system. The remote controlled solar powered skylight comes out of the box fully assembled, just mount the solar panel to the pre-mounted spacers on the skylight frame and plug them together. No need for an electrician or complex electrical hook-ups. The solar panel will work on cloudy days and with indirect light. It does not have to be exposed to direct sunlight to function. 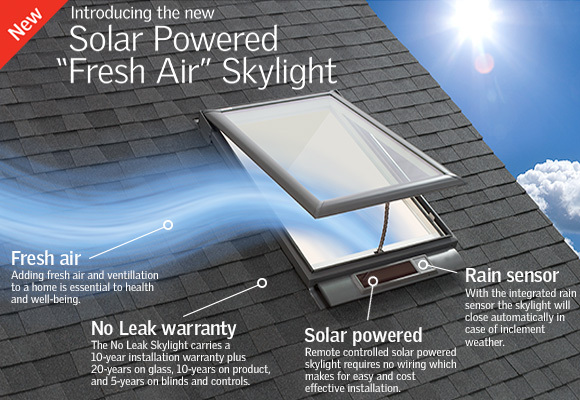 With the integrated rain sensor the solar powered skylight will close automatically, in case of inclement weather. Inner pane is laminated for additional safety. This means that if the glass accidentally breaks, the glass does not shatter. Laminated glass meets codes for products installed out of reach. If the Fresh Air Solar Powered Skylight is ordered with a factory installed blind, the skylight and blind will arrive pre-programmed to one unified remote control. The blind uses its own independent, built-in, solar panel and power system. Eight factory installed blinds are available to include in the purchase of your skylight.<br /><br />If the Solar Powered "Fresh Air" Skylight is ordered with a factory installed blind, the skylight and blind will arrive pre-programmed to one unified remote control. The blind uses its own independent, built-in, solar panel and power system. VSS C01 - Solar Powered Fresh Air Skylight by VELUX- 21" x 26 7/8"
VSS C04 - Solar Powered Fresh Air Skylight by VELUX- 21" x 37 7/8"
VSS C06 - Solar Powered Fresh Air Skylight by VELUX- 21" x 45 3/4"
VSS C08 - Solar Powered Fresh Air Skylight by VELUX- 21" x 54 7/16"
VSS M02 - Solar Powered Fresh Air Skylight by VELUX- 30 1/16" X 30"
VSS M04 - Solar Powered Fresh Air Skylight by VELUX- 30 1/16" X 37 7/8"
VSS M06 - Solar Powered Fresh Air Skylight by VELUX- 30 1/16" X 45 3/4"
VSS M08 - Solar Powered Fresh Air Skylight by VELUX- 30 1/16" X 54 7/16"
VSS S01 - Solar Powered Fresh Air Skylight by VELUX - 44 1/4" x 26 7/8"